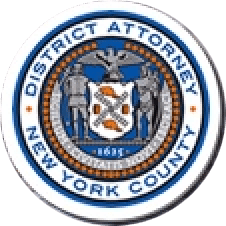 Manhattan District Attorney Cyrus R. Vance, Jr., today announced the indictment of six individuals and one company, 92K BLVD., for the theft of more than a quarter of a million dollars through a scheme involving credit card fraud and shell corporations. The defendants are charged in a New York State Supreme Court indictment with Grand Larceny in the Second and Third Degrees. According to the indictment and documents filed in court, between November 2013 and January 2014, SAMUEL BERKOVITS, 50, BEZALEL MERMELSTEIN, 40, MOSHE POMERANTSEV, 22, NAFTALI SAFERN, 30, and YEHUDA TYRNAUER, 29, used their personal credit cards to make thousands of dollars’ worth of purchases from 92K BLVD., a shell company, which maintained an American Express merchant account linked to a Bank of America account, both of which were owned by ISRAEL FISCHER, 62. During the same period, numerous checks in amounts ranging from $5,000 to $15,000 were written from 92K BLVD.’s account to other outside companies, through which thousands of dollars in checks were then distributed back to the individual defendants in amounts ranging from $4,000 to $9,000. As part of the defendants’ scheme, the supposed buyers requested refunds shortly after making the purchases, prompting American Express to credit their accounts and attempt to retrieve the matching funds from 92K BLVD.’s merchant account. However, American Express was unable to so, and when Bank of America was contacted about the missing funds, American Express received information that there were insufficient funds in the account, causing American Express to suffer more than $270,000 in losses. Assistant District Attorney Alona Katz is handling the prosecution of the case under the supervision of Assistant District Attorneys Daniel Holmes, Elizabeth Roper, and Jeremy Glickman, Deputy Chiefs of the Cybercrime and Identity Theft Bureau, Assistant District Attorney Brenda Fischer, Chief of the Cybercrime and Identity Theft Bureau, and Executive Assistant District Attorney Michael Sachs, Chief of the Investigation Division. Cybercrime Analyst Lilianna Rembar and Detective Ramon Velez, of the Cybercrime and Identity Theft Bureau Squad, and supervising Sergeant Robert Li, also of the Cybercrime and Identity Theft Bureau Squad, provided additional assistance with the investigation. District Attorney Vance thanked American Express, and in particular, Investigator Al Cavuto, for their assistance with the investigation.